I've read several of Richard Dawkins' books and have thought about reviewing him before. The thing that has put me off doing that is that his stance on atheism is so entrenched and evangelical that I fear his presence on these pages would serve merely as an irritant to many of my readers. Nevertheless, I admire much of his writing, even though I take personal exception to his forthright dismissal of studies of the paranormal and UFOs. No one is perfect, after all. 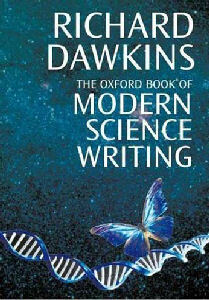 A review of 'Modern Science Writing' sits rather better on the Dark Star site. Simply put, it is a collection of extracts from 20th Century science essays and books. Some of the authorship is highly celebrated, like Einstein, Crick, Watson, Oppenheimer, Hawking and Sagan. Some of the pieces are more obscure in origin. This offers the reader a chance to dip into the writings of the great and good, and also to experiment with the writings of less fashionable scientists who have impressed Professor Dawkins. For what runs through the book strongly is his stamp of approval. Dawkins is a biologist and geneticist and, until very recently, an Oxford don (he recently retired, I believe). His selection shows a considerable bias towards his favoured subjects, and also to his Oxford colleagues, especially in the first section of the book. I think he includes writings from almost all of the founders of the neo-Darwinian Modern Synthesis. But this is understandable - if you or I were to select passages from our favourite books, then those familiar to us, or important to us, would feature highly. But it is not all about Darwin and natural selection. There is much from the fields of mathematics and physics, and even a little chemistry. This is natural science at its most pure, yet approachable for readers with a general science background. To review each piece would be a ridiculous task here (not least because Dawkins provides ample commentary for each selection in the book). The variety of the work on offer also makes it difficult to pick standard examples. But I especially enjoyed extracts written by Francis Crick, Richard Fortey, Steven Pinker, Jared Diamond, Loren Eiseley, Albert Einstein, Paul Davies, and Carl Sagan. I found the choice of Fred Hoyle's work peculiar, and G.H. Hardy's mathematics impenetrable (Dawkins kept equations to a minimum in this book, wisely, but this essay flirted with them feverishly). The theme of the book for me appeared to be the desire to elevate good science writing to the standing of literature. Perhaps this is a noble quest, I'm not sure. It probably doesn't quite do the job, I would argue. Where there is merit to an elevation of scientific writing, however, was the way science and philosophy danced with each other across the pages. An appeal in Dawkins' other books, which seek to show how natural selection acts as a remedy to religion, is that the universe provides wonder and beauty enough for us humans, precluding the need to resort to a belief in God. Again, you may not agree with this stance, and I'm not sure I do either. But, like 'The Tao of Physics', modern science has created its own philosophy (in years gone by, science was actually an offshoot of philosophy). Certain ways of thinking are acceptable to this philosophy, whilst other ideas are not. For instance, the notion of extraterrestrial life visiting Earth is not acceptable. The notions of psychic events, paranormal encounters, or religious miracles, are not permitted. Evidence for such things is discriminated against by Science with a big S. As areas of study, they are ignored. Yet, these areas are arguably the next frontier to be explored. As I read Brian Greene's extract about string theory, I remembered all the thoughts I had when I first read his 'The Elegant Universe'. Multiple dimensions surely provide a new opportunity for understanding a deeper series of connections that may lie within the fabric of reality. Everything could be connected. Dawkins would dismiss such thoughts as mystical, and unquantifiable. He would lead us to more solid ground. This is an argument that will continue to rage for many years, and is one that, perhaps, defines Humanity's longing for answers that we may never get. This book, this anthology of science, shows one thing in that context - even if the ultimate goal may never be achieved, the journey of discovery itself is as rich and wonderful as you could wish for. Its exponents glory in this richness, and convey the complexities of life and the universe with a clarity that can enhance our minds, as well as our souls.